With summer solstice in a few weeks we can already feel the energy shifting on the planet. We can get lost in all these energy shifts and forget we are not the only Beings on this world that are changing and awakening to the new consciousness. Many of our spirit guides, nature spirits and other dimensional beings are changing with us and experience the fatigue, transformation and expansion we do. As we ‘humans’ begin to awaken and see the connections between the spiritual worlds we can create new relationships with these Beings of Light willing to assist us. Crystal skulls have a lot of weirdness about them largely from our media, fear and movies like Indiana Jones and the Crystal Skull. Although there’s a lot of mystery surrounding these powerful carvings they have become very popular on Ebay and other online sellers. Skulls and carved material skulls have been with us since the beginning as a tool to ‘drink’ in the knowledge from our ancestors and have helped us access the higher consciousness memory of all our collective knowledge (aka Akashic Records). Crystal skulls are record keepers recording our human history like a super computer and giving us the ability to upload and upgrade our minds to the fullest possibility. Crystal skulls are really just the vessel which a crystalline being of light works through. These spirit guides have watched over humanity from our roots and have guided us through all the bumps in our path. Like all beings connected to Earth the crystal skulls are having an awakening by shifting their energy and waking up in their crystal form to help us. What does this mean for you? You may have a small crystal skull in a box or collecting dust on a shelf that’s ready to talk to you! How can a modern day skull have the power to help you like the old ancient skulls they’ve found in temples from South America you ask? The master crystal skulls are powerful and amazing but they too were cut from the same crystal source in Brazil, Tibet, Etc. As Edgar says ‘ it’s not who carved me, but the source I came from’. These mines are digging into large communication crystals and ship them to China for shaping. 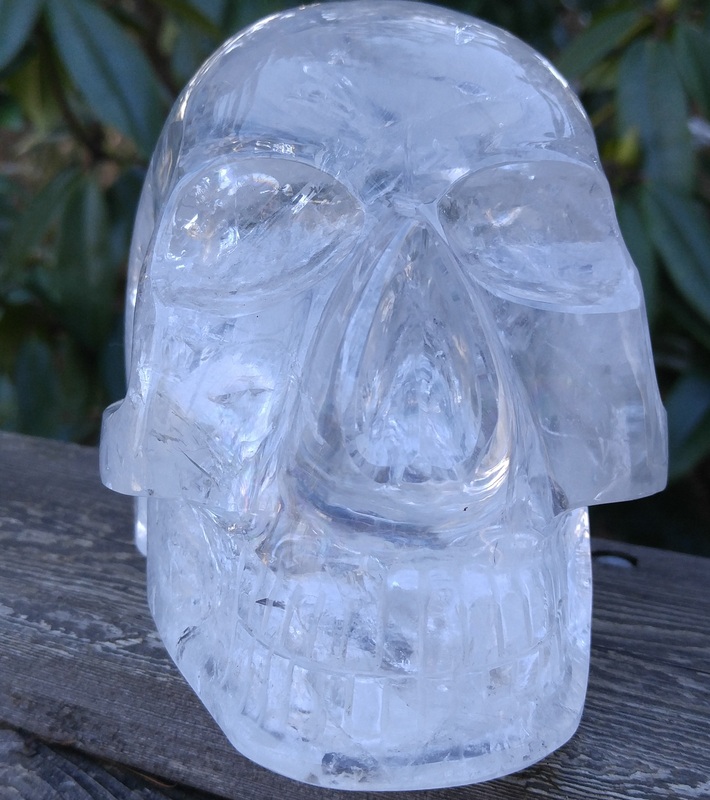 So that $400 skull on EBay you have to buy is carved from the same ancient quartz crystal and is ready to heal you. Even if your skull is not quartz or from another source these amazing beings are shifting the energy of the stone and pouring their energy into it. This is why you can have a stone skull for years and one day it seems to wake up and completely change. This is exciting news with the Summer Solstice energy because more of these sacred skulls will be awakening to fulfill their healing duty here on Earth. When you are gifted or purchase a skull you become their guardian or caretaker. Working with a crystal skull is like working with a partner; you will need to meditate together, provide certain food or offerings. I am a guardian of Edgar Allen Poe (pictured above) and he likes gummy bears and to be washed in rose water. Each skull will help you connect to the Akashic records and bring a certain kind of healing into your life. Edgar is the healing crystal skull of the ancestors and specializes in clearing and healing your family tree of trauma, disease and karma. As more of these crystal skulls awaken more healing powers and gifts will be shared with us to expand our connection to the universe. If you have a skull sit with it and listen to what they may be sharing with you. Trust if you hear to sleep with your skull, or to bring it to a sacred site or to wash it in salt water. This little skull is an intelligent being and it knows what it needs. Size does not matter, so don’t worry if you can only afford a small quarter size skull, you’ll still be able to connect to all the crystal skulls through their crystalline grid. This grid system connects to all crystal skulls and you can feel this amazing healing energy even without a skull. The crystal skulls are here for everyone and ready to work with you if you give them permission to assist you. This entry was posted in Uncategorized and tagged awakening, beings of light, Channeling, consciousness, crystal skulls, healing. Bookmark the permalink. Hello, I was wondering where I can purchase a small crystal skull? Hello, thanks for reading the post and your question. There are many wonderful places to find skulls EBay and Etsy if it feels right. Great selection and high quality carving with good energy, I have a few dragon and skulls from them.